One of my favorite books is Ben Graham’s “The Intelligent Investor”. 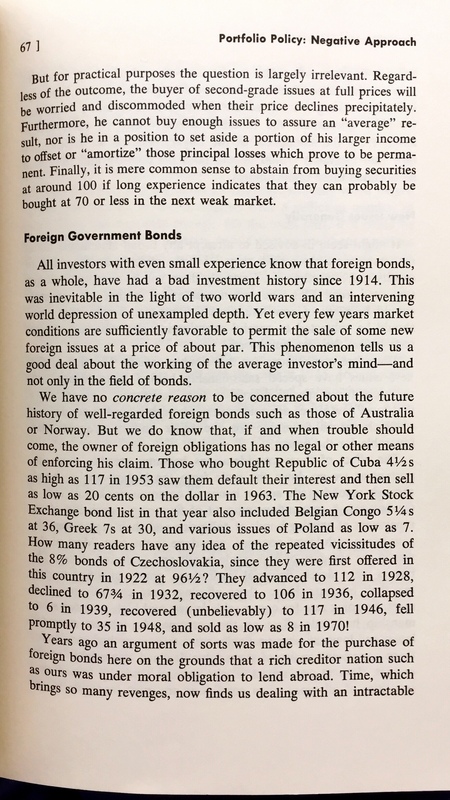 This page from the fourth revised edition (1973) gives a short but fascinating history of some amazing price swings in the not-too-obscure category of foreign government bonds, interesting in part because the government issuers aren’t around in the same form any more (Cuba had a communist revolution and faced embargoes from the US for 50 years, Congo gained Independence from Belgium, and Czechoslovakia split up and joined the EU). One constant throughout: it is still better to buy low and sell high rather than the other way around.